'The Ghats from Ryghur'. Lithograph by J.H. Lynch. Plate 6 from Eight Most Splendid Views of India, sketched by an Officer in the Indian Army, drawn and printed by Baron A Friedel, London, 1833.
bl.uk > Online Gallery Home	> Online exhibitions	> Asia, Pacific and Africa Collections	> 'The Ghats from Ryghur'. Lithograph by J.H. Lynch. Plate 6 from Eight Most Splendid Views of India, sketched by an Officer in the Indian Army, drawn and printed by Baron A Friedel, London, 1833. 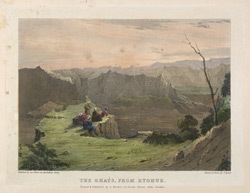 Coloured lithograph of 'The Ghats from Ryghur' by J.H. Lynch from an original drawing by Baron Adam Friedel (fl.1833). Plate 6 of 'Eight Most Splendid Views of India, sketched by an Officer in the Indian Army' printed by Baron A Friedel in London in 1833.